RiseSun Real Estate Development Co., Ltd. Is a China-based company engages in the development and management of real estate properties. The company was founded on December 30, 1996 and got publicly listed on 2007 years (002146: Shenzhen). 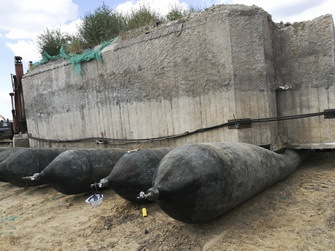 Two pieces underground blockhouses weigh 600 tons and 400 tons respectively were found in construction area of industrial park. The bigger one measured by 10 .7m long , 6.1 m wide and 4 m high; small one measured by 9 m long and 6 m wide with 4 m height. Those two blockhouses need to be moved from original position to 50 m far with a rotating 20 degree angle and remain the same elevations. 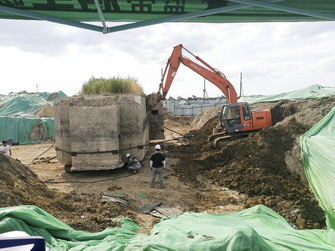 Those bombproof shelters were built with steel reinforced concrete, thickness of top cover reaches 1 meter, base plates are approximate 300 mm thick. They were buried 2 m depth under the ground. 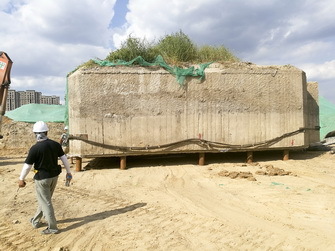 Eversafe Marine pioneered structure relocation with marine airbags with proven track record, completed the 3000 tons structure 200 m long distance movement in 2012 years and hundreds pieces concrete structures subsequently.To relocate blockhouses on natural ground using marine airbags is the most economical and convenient method. Eversafe Marine got the contract unsurprisingly. It took total 7 days to complete two blockhouses moving. The big one moving is complicated, need to turn structure around to reach final position. 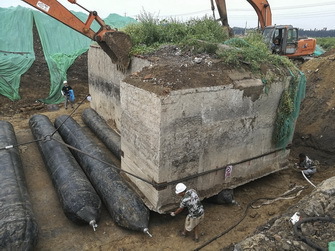 Four channel were dig under the ground of blockhouse bottom to insert lifting airbags for the 600 tons structure. After structure is lifted, two rolling airbags were placed to support structure together with 4 lifting bags. Then one by one, the lifting airbags were deflated and removed , when the channels were refilled, airbags were inserted again. Before move structure forward, there are 6 airbags to support the 600tons structure. Two excavators were deployed to hold the pull structure during the moving process. 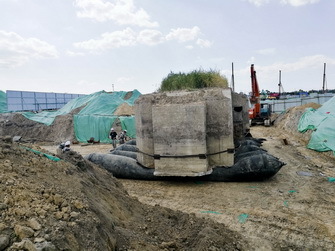 When the blockhouse reaches its final position, solid blocks were placed under structure, then people remove airbags to sit structure on blocks. 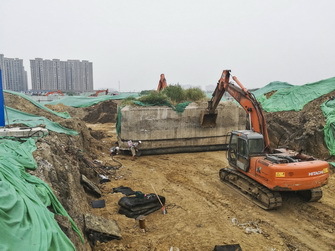 Using excavator, people dig out blocks to make structure sit on ground finally. Eversafe Marine now has a high-trained, fast responding engineering team can complete complicated projects on time and budget. As the user of marine airbags, Eversafe engineers give feedback to group company always , Evergreen Maritime, to make the better ,the stronger airbags for engineering projects.